Tucked away at the southern tip of Santorini are the ruins of one of the Bronze age’s most sophisticated settlements, which prospered for centuries before being eradicated by a great volcanic eruption. This secret coastal village is studded with pastel-colored houses all piled on top of one another. Like the Roman ruins of Pompeii, the remains of the Minoan town of Akrotiri are remarkably well-preserved. The settlement was all but obliterated in the middle of the second millennium BC, when the volcano it sat upon, Thera, erupted, and its inhabitants fled. 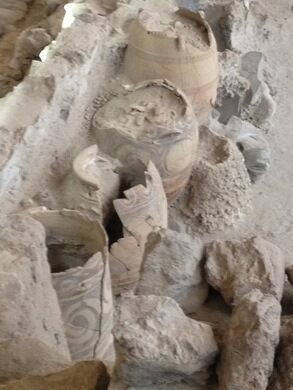 The volcanic matter enveloped the entire island of Santorini and the town itself, preserving the buildings and their contents, and visitors can still identify houses and pots. Unlike Pompeii, no human remains have been found at Akrotiri, and only one gold object was found on the site, suggesting that the Minoans performed an orderly evacuation before the eruption, and they had time to take their valuables before they fled. The Minoan civilization existed on Crete and its surrounding Greek islands, and flourished from approximately 3600 BC to 1400 BC. The eruption of Thera has been credited with its demise; geologists have called it the most destructive natural event in recorded history. 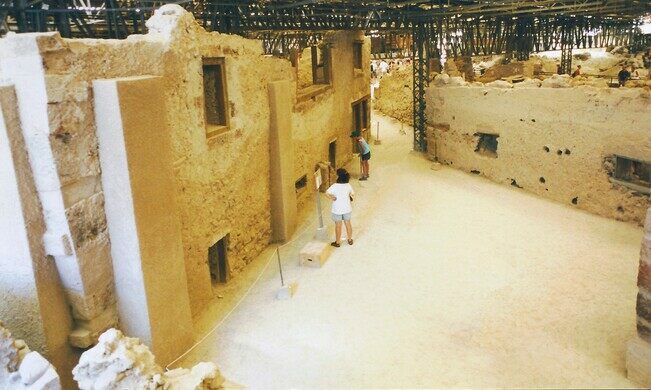 The town of Akrotiri was an outpost of Crete which dates back to the third millennium BC and gradually developed into one of the main ports and urban centers of the Aegean. 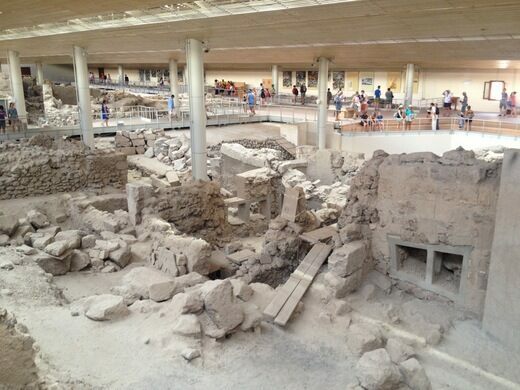 Akrotiri was incredibly sophisticated for its time. The buildings in the town were multi-storeyed and faced with masonry, and the elaborate drainage system was highly evolved–it is here that we see some of the first instances of indoor lavatories. The town’s elaborate architecture and vivid frescoes indicate a highly cultured settlement. After being closed for a number of years for repair work, the archeological site has reopened to visitors, and can be accessed by car or bus from Fira.Open hours between November and March: from 08.00 to 15.00, every day except Monday.Open hours between April to October: from 08.00 to 20.00, every day.